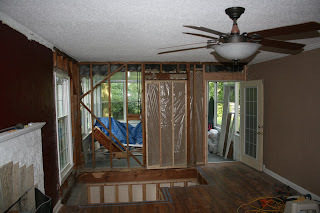 Did you know that we've been remodeling our house? :) Ha, ha - I think everyone and their brother knows about it because it's been going on for SO LONG and consumed so much of our time! We actually started some of the pieces almost 3 years ago, pretty much immediately when we moved into our house. But the majority of the work has happened within the last 6 months or so. I can't wait to have official 'after' pictures to show - but for now this will have to do. Here's a little peek at the project. 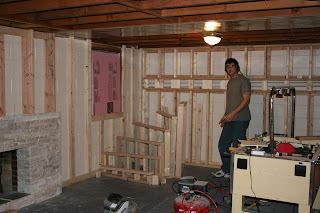 This first picture is a small part of the way the basement was finished when we moved in. Ick! 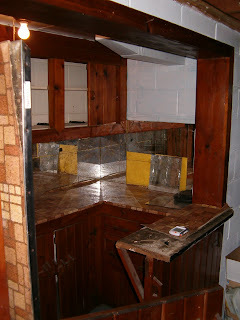 These cabinet things were a home to many mice (double ick) and looked crazy! The first thing we did in the basement was rip all of this out. 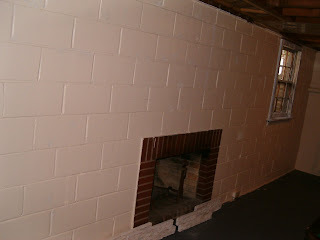 This is the opposite wall in the basement which had an 'interesting' fireplace. Here's the beginning of the staircase being built. This is the part that has taken the most time BY FAR! Once Michael built it up far enough, he started to cut the hole in the floor upstairs and that's where the big mess started (see pics below). Thankfully that part is almost over! You can also see the partially done fireplace on the left. Here's a more recent picture of the staircase pretty much completed except for the railing. Michael hand-tied some rebar and started making the top of the curved railing piece. The next step is to cut the same stone we put on the fireplace into little pieces to create the inside curved wall. But you can see here that the lights are in (after rewiring all of the electricity to the room), the drywall is done and primed, molding is up, and we're ready to finish wallpapering the back wall, build the built-ins, finish the mantle, paint, and get carpet! Believe it or not, the end is in sight! This is the 'before' of upstairs directly above the room that we finished in the basement. 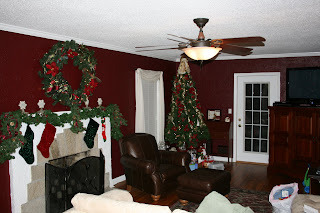 This is from Christmas 2006 but you can see the odd fireplace, the huge fan in the middle, and that the door to our 3 season porch is in the middle of the far wall. Here is Michael working on the fireplace upstairs after tearing out the old one. It's pretty much done now...but I can't post the complete 'after' pictures yet - you'll just have to wait! This is the upstairs once it was torn apart. The door to the 3 season porch was moved, a hole was cut in the floor for the new staircase, all the electrical wiring had to be redone, we insulated, etc., etc. Then Michael built a wall and a bookshelf back in to surround the staircase, we hung new lights everywhere upstairs, wallpapered, put up new molding, and the list goes on and on. Hard to believe we've come so far! Actually, when Michael got to the big demolition I took the kids away for a few days so he could work uninterrupted (and we could escape the mess). He called me after getting this far to discuss whether we just change the plan and winterize the 3 season porch so we could open the room all the way up. It would have been great to have it all open like that - but wasn't in the plan so we abandoned the idea. Here is a somewhat-finished upstairs...although you'll still have to wait to see the whole thing done. You can see the fireplace (before the mantle was built), new lights, the door is moved and drywall is done. Since this picture we've added the mantle, crown molding, a little 'photography gallery' on one wall, and many finishing touches. The 'sparkly tree' wallpaper (which you can't see very well in this picture) is one of my favorite things and I have another wallpaper that will go on the back wall by the new staircase. I had to do wallpaper because all of the original walls are stucco and the new walls are smooth. It looked weird and disjointed until I added the texture of the wallpaper - now we love it! It seems like we will never get done, but I'm always encouraged when I look at the 'before' pictures and see the progress we've made. It's wonderful to be able to live in the upstairs family room again. Now I'm looking forward to getting the basement couch out of the kids bedroom and the pool table out of ours! Eventually, we'll have a little more work in the basement to redo the full bathroom and a little kitchenette down there - but it will be so nice to have a place to keep the kids' toys, watch movies, and just hang out. Stay tuned for the 'after' pictures SOON!